Two of the human body’s key functions consist of adapting to its environment and reacting to any kind of attack. Adaptation and adequate response are the immune system’s two principal elements: the response occurs when the body recognises and then defends itself against an antigen. A larch extract called arabinogalactan has been shown to be crucial to these two processes in attacks by a foreign body in the gastrointestinal tract. The mechanisms involved include the indirect effects of lactic acid-producing bacteria and bacterial constituents of immune cells, and the production of short chain fatty acids and binding of these acids to their leucocyte receptors. Studies have shown that supplementation with larch arabinogalactan positively alters the activity of natural killer cells (NK lymphocytes), cytokines (essential for cellular communication) and macrophages. Arabinogalactan supplementation also confers antioxidant benefits, related to the many polyphenols present in larch. Other plants such as echinacea, cedar and wild indigo (baptisia tinctoria) contain similar substances though at lower concentrations. 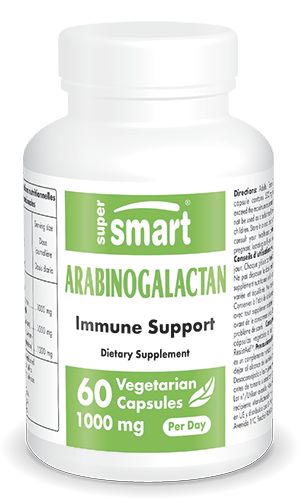 Arabinogalactan helps increase both numbers of beneficial immune cells and antibody production based on the immune suppressor, in order to trigger an appropriate immune response. It supports Natural Killer cells (cytotoxic lymphocytes) to ensure optimal well-being. Research in mice confirmed that activity of these cells was stimulated by daily administration of arabinogalactan over two weeks. It maximises production of the cytokines essential for cellular communication. Arabinogalactan works to induce production or circulation of a number of cytokines such as interferon gamma (IFNγ), tumour necrosis factor (TNF) and different interleukins (IL1 or IL6). It also supports macrophage function. Macrophages are important elements of the body’s defence system which originate from monocytes, a type of white blood cell, a function of which is to destroy harmful organisms. When administered in combination with extracts of Echinacea to healthy subjects, arabinogalactan increases blood levels of monocytes in peripheral circulation, and in vitro, levels of macrophages. It also increases levels of white blood cells. Research has shown that arabinogalactan supplementation significantly increased the number of circulating white blood cells. This is primarily the result of an increase in their increased concentration in neutrophils. Recent studies have shown that arabinogalactan triggers an adaptive immune response to specific antigens. In particular, a higher immunoglobulin G antibody response to vaccines was noted during the 10 weeks following vaccination. The study also showed an immunomodulatory effect which does not affect other immune parameters in any way. The phenols and polyphenols present in arabinogalactan are well-known and widely-found in fruit, vegetables and other plant substances. They combat the free radicals considered to be a key cause of cellular ageing. Some of arabinogalactin’s active ingredients, such as quercetin (Super Quercetin) and taxifolin (Taxifolin) have biochemical properties that are highly antioxidant and chemoprotective. • liver cancer (as it combats the development and growth of cancer cells). A supplement with extensive therapeutic powers, arabinogalactan deserves a special place among natural pharmacy products. Other ingredients : maltodextrin, magnesium stearate, silicon dioxide. ResistAid™, Lonza, Suisse. Each capsule contains 500 mg of ResistAid™.